Choosing the right tires for your car, SUV or truck is one of the most important decisions we have to make in regards to our personal transportation. It is of utmost importance during the winter, when in many areas of the country the presence of ice and snow on roadways creates a deadly hazard. So many people try to get by on so-called all season tires and tires that are nearly bald. When you hit ice and snow, with these tires you are just not going to go anywhere and worse you may be involved in an accident. It is not a difficult process if you have the necessary information. The first thing you should do is check your vehicle owner’s manual to find the manufacturer specifications for the types and sizes of tires recommended by them. If your tires were new with your car, then the dealer will have installed the correct tires and you can usually get the same size as those that are on the car. Of course you will want snow tires instead of summer tires, but they will be the same size. Your dealer or your local mechanic can usually look up the information as well regarding the best tires for your car. Install mud and snow tires on your car or SUV. These tires can be used anywhere as long as they do not have metal studs on them. Studs were allowed at one time, however communities found that studs would chew up the road too much and they were also dangerous if a stud became loose and flew out of the tire. If you live in an area where ice is common in the winter, be sure to use metal-stud tires that are available. Keep your other tires(if they are in good condition) for the end of the winter. These metal stud tires are only allowed during the winter season in some states. They are banned in 10 states and in most provinces of Canada. Make sure that all of the snow tires you use are of the same size, type and tread. This is particularly important if your vehicle is front wheel drive. Using mismatched rear wheels may result in a loss of traction when braking on the icy roads of winter. You can also lose stability at higher speeds. All four tires must be the same. When choosing tires be aware that equipping your vehicle with over sized tires may result in difficulty steering. They can also rub the fender wells or suspension underneath. You will also find that you are actually going faster than what is reported on your speedometer. The speedometer is driven from the transmission and not from ground speed. As a rule, snow tires are manufactured with large empty areas in their tread so that they will have more traction on snow than normal tires. Regular all season type tires are more concerned with marrying a quiet ride with a modicum of traction. 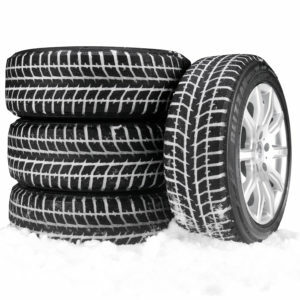 Snow tires are also made of softer rubber to enable a stronger grip on the road. They tend to wear more quickly, especially if you drive your car with them in the summer time. Another time tested method that can be used when conditions warrant is the use of tire chains. Installing tire chains can increase traction as much as 200%. However you are limited to the speed that you can travel with chains installed. Your gas mileage will suffer significantly. Again, make sure that these chains are of the right size and type for your particular tire . The final tip is check on the age of your new tires. Many, although new, are sold years after they were manufactured. Rubber does dry out and become brittle. Better to go with tires that have been manufactured more recently. Following the preceding tips will help you to safeguard you and your family in the upcoming winter.